Sponge cake wrapped in paper is always my kids favourite. They love to have it from Kerala Bakeries. It is better to avoid bakery sweets and snacks these days because of food adulteration. So i always prefer to make those stuffs at home for the safety of our kids. I highly recommend all my readers to bake a cake at least once in our lifetime. Yes, you can bake cakes even without an oven or on the stovetop, or in a nonstick pan or in a cooker like so. I had posted THE RECIPE FOR SPONGE CAKE without using an oven a few months back. So kindly please check the recipe of the same on my blog or please click HERE for the sponge cake recipe without an oven. 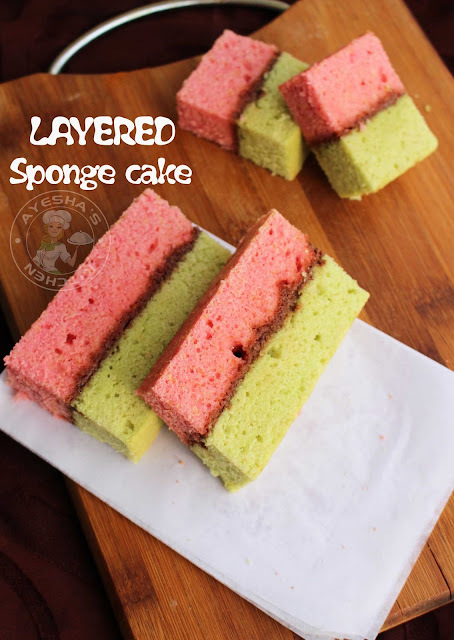 We all know that sponge cake is a cake based on egg, flour, sugar, butter and sometimes baking powder. 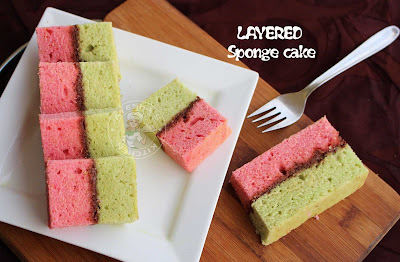 But this two colored sponge cake calls for baking powder and I skipped the use of butter also. Kindly please check the detailed video showing how to bake a double coloured sponge cake in a single pan. Sieve together All-purpose flour, baking powder and salt. Mix well and set aside. Now let's make the batter. Whisk together eggs and sugar in a bowl using an electric beater until it turns light and airy which is very important. You have to whisk it well until it turns to white in colour. Then add vanilla essence and veg oil. Again whisk well. Now add the flour mixture little by little and fold well. (do not use the whisker ). Finally, add milk and again fold. Now the batter is ready. Divide the batter into two bowls. Add pista essence in one bowl and mix well. To the other bowl, add rose milk essence and mix well. Pour the batter into the prepared pan without disturbing the partition in between. Tap the pan gently. And then bake it in the preheated oven at 150 degree C for 30 minutes. When done, remove from oven. Let it cool well. Take the cakes out of the pan. Separate the butter paper and then set aside the two colourful cakes. Now gently cut the top of the cakes (u can use the leftovers for making cake lollipops or for any other dessert recipes). Apply Nutella on one cake and keep the other cake upside down over it. Gently press it, so that it sticks well and looks like a single cake. Trim the sides if required. Let it covered with a foil for few minutes for the perfect slice. Now slice and serve. Yummy and eye-catching cake is ready. 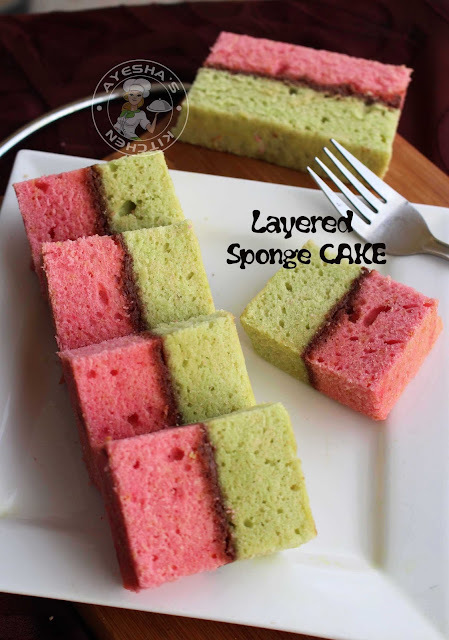 Click this link - how to bake bakery style two colored sponge cake. It is extremely easy to make fresh whipped cream at home to frost on cakes and pastries. You can make whipped cream in different ways. Whipped cream from milk or heavy whipping cream etc. But here I am showing how to make whipped cream using whipping powder and chilled milk. There are several brands of whipping powder available in the market. I prefer using Dream whip whipping powder. If you are using any other brands of whipping powder other than this brand, kindly please check the package instructions before whipping. As the whipped cream is a cream which is whipped by a whisker or mixer until light and fluffy, you need a hand whisker or wire whisker. 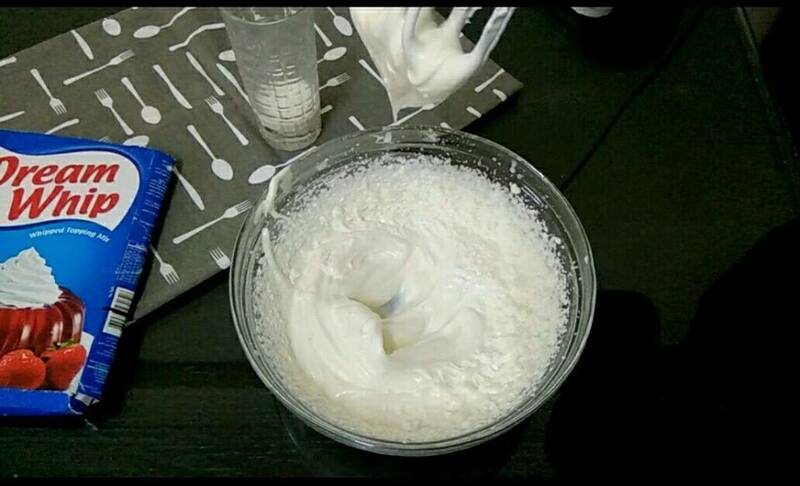 Though it is very easy to make whipped cream using whipping powder, still you must be very careful while whipping. Whipping the mixture continuously for few minutes will leads to the formation of butter. So be careful that, you must not beat the cream at high speed continuously. That means you have to beat the mixture for 30 seconds over high speed and then stop for a second or two and again beat. Like so, continue the process until you reach the required consistency. Scoop a spoonful of whipped cream, and invert the spoon. If the spoon holds the whipped cream without falling down, then it is whipped to the right consistency. And like so as per the package instructions of the Dream whip whipping powder, a sachet of whipping powder calls for half a cup of chilled milk where a cup is equal to 240 ml. But i have used only less than half a cup for a sachet of whipping cream. So use accordingly. And keep the milk out of the refrigerator for 10 minutes before adding it to the powder. Freeze the glass bowl and whisker for 30 minutes before whipping which makes the cream to thicken fast. Kindly please check the below video showing how to make perfect whipped cream at home using whipping powder. Coconut milk recipes are my all time favourite. To all fish lovers, here is a super delicious fish recipe which pairs best with palappam, chapati, ghee rice and Malabar pathiri. Yes, coconut milk and fish is such a great combo and so this recipe is always one of my absolute favourite dishes. 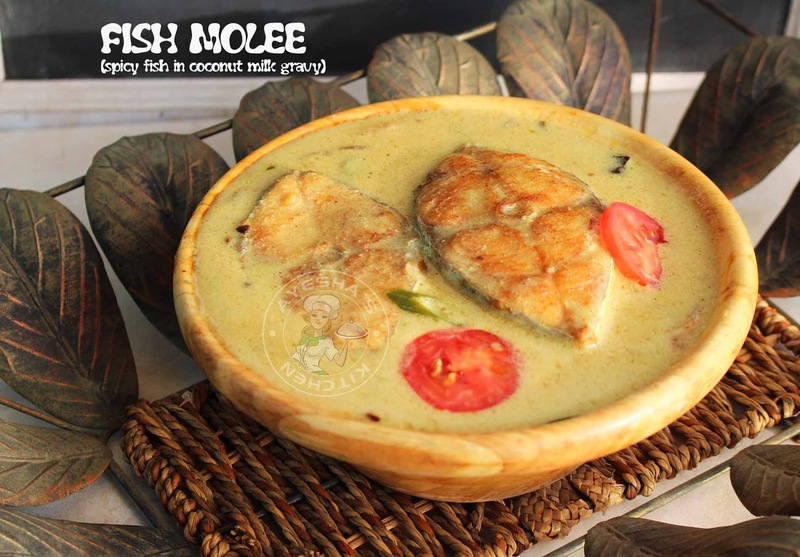 Though Fish molee/ fish moilee/meen moilee/fish molly has a Portuguese or Indian origin, it is very popular and common dish in South India, especially in Kerala. Here am sharing the recipe showing how to make Kerala style fish molee / fish moilee. 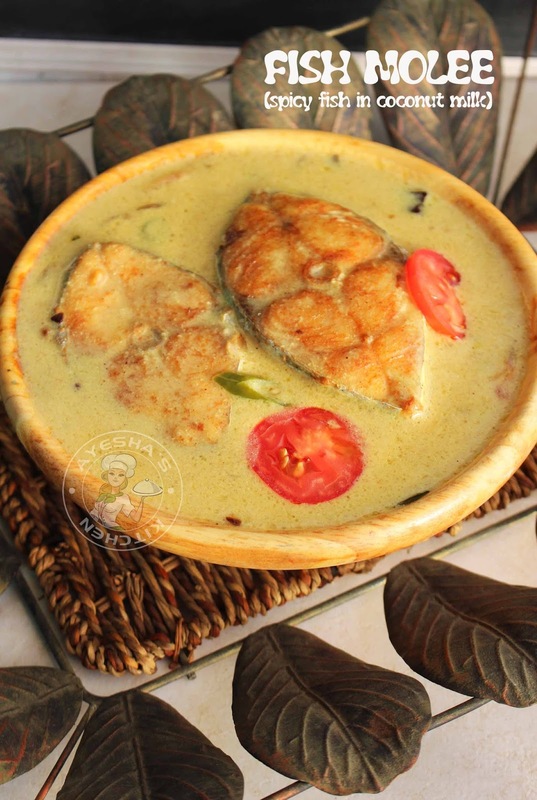 The half fried fish is simmered in spicy coconut milk gravy that imparts a special flavour to this curry recipe. The curry is mildly spiced with pepper powder and chopped green chillies only. Chilli powder is not at all used in this curry and so those who want more hotness can add more green chillies or can add green chilli paste instead. The one thing you should keep in mind is that you have to use fresh fish for this curry. Like so, fish molly made with kingfish (ayakoora / neymeen)and Pomfret is the best. But you can also use any fish that is fleshy. So here is the recipe showing how to make fish molly/fish moilee. Please check the below video showing how to make fish molly. Please watch and SUBSCRIBE my channel too. Clean the fish slices well and set aside. Then marinate the fish slices with chilli powder, turmeric powder, vinegar and salt. Keep refrigerated for half an hour. Now to the same oil in the pan, add the raw spices (cinnamon, cloves, cardamom, bay leaves, fennel seed, fenugreek seed). Fry over a low flame for a minute. Then add green chillies chopped, garlic chopped, ginger chopped and curry leaves. Saute well until the raw smell disappears. Now add sliced onion and saute until onion turns soft and golden. When done, add required salt, turmeric powder and pepper powder. Mix well to combine. Now add the thick coconut milk along with a cup of warm water and mix well. When it starts boiling add the cornflour mixed water and mix well for a minute. Then add the half fried fish and gently swirl the pan or mix. Check for salt and pepper powder. Then add the thick coconut milk (half a cup) and cook until it starts to boil(do not let the curry to boil, turn off the flame when it starts to boil). Finally, add vinegar and mix. Now lets temper the curry. Heat a pan with oil. Fry the finely chopped shallots, garlic, curry leaves and pour it over the prepared curry. Serve hot along with ghee rice, chapati, poori etc. Chutney powder is a condiment like a pickle and is a great accompaniment to steamed rice or idli, dosa etc. There are many variations in chutney powder. 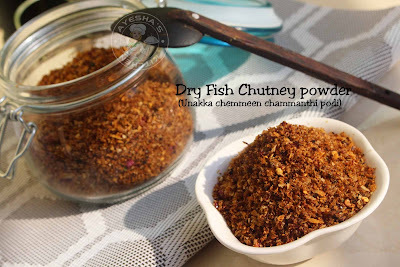 Here am going to share the recipe for a chutney powder with dried prawns. 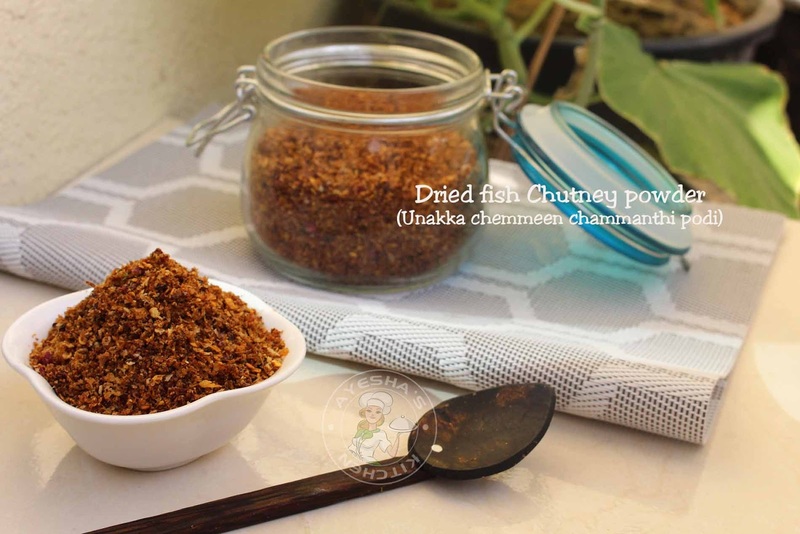 Dry fish chutney powder/ dried prawns chutney powder/ Unakkameen chammanthi podi / Unakka chemmeen chammanti podi is a very aromatic chutney powder which is combined with coconut oil and served along with steamed rice. 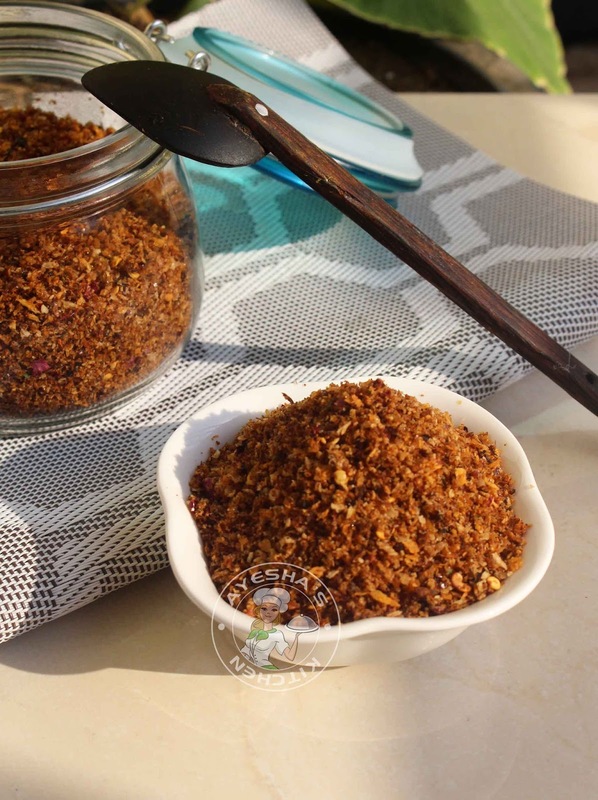 This condiment or chammanti podi is very popular in South India, especially in Kerala. Scraped coconut, dried red chilies, shallots, garlic, dried prawns, tamarind are dry roasted and powdered to make this aromatic treat. The shelf life of this powder is one month or more when stored in refrigerated. So let us see how to make this dry prawns recipe or unakkameen chammati podi. Tamarind - a small lemon sized, do not add more, discard the seed. Heat a pan and dry roast the dried prawns (unakka chemmeen) over a medium-low flame until it is roasted well (remove from flame when it turns slightly crisp). Transfer it to a plate. In the same pan, dry roast dried red chilies until it puffs up (add some salt while toasting ). It will take around 6 minutes over medium-low flame. Saute continuously. When done, transfer it to the plate. Again in the same pan add scraped coconut, curry leaves, chopped garlic and shallots, tamarind. Saute until the coconut is roasted well and turns crisp (over low flame). When done, add salt and transfer it to the plate. Let it cool slightly. Then powder it until fine or little coarse as per your preference. Once cooled, transfer it to an airtight container and keep refrigerated. You can use this chutney powder / chammanti podi for months when refrigerated. While serving, take few teaspoons of this powder and mix it with some coconut oil. Or take few teaspoon of this powder and grind along with freshly scraped coconut for the freshly ground condiment or fresh chammanti. You can add less dried red chilies as per your preference to hotness. To avoid the difficulty while dry roasting the red chilies, add some salt to the chilies. If so, add less salt to the chutney powder. Add coconut and dried prawns in the given proportion only. Video showing how to make unakkachemmeen chammanthi podi . 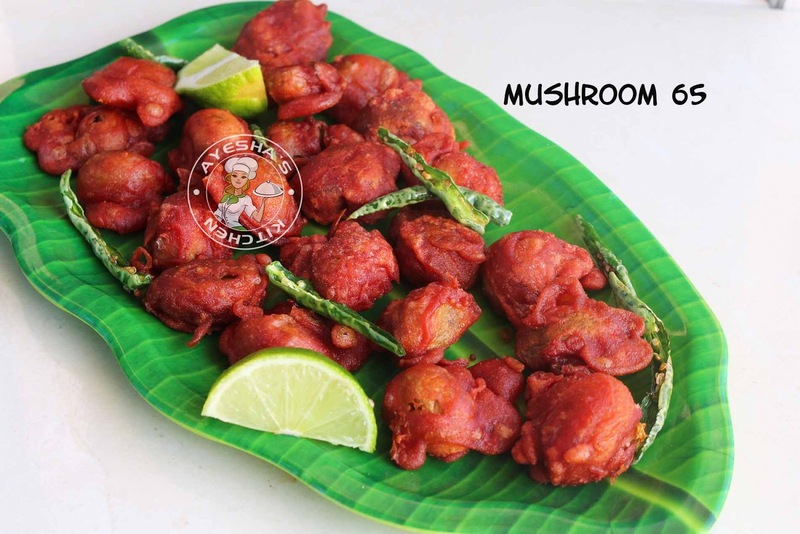 Mushroom is a great vegetable that can substitute for chicken. Some people depend on vegetable dishes by sacrificing their favorite nonveg dishes. But this vegetable mushroom will not come under this category. 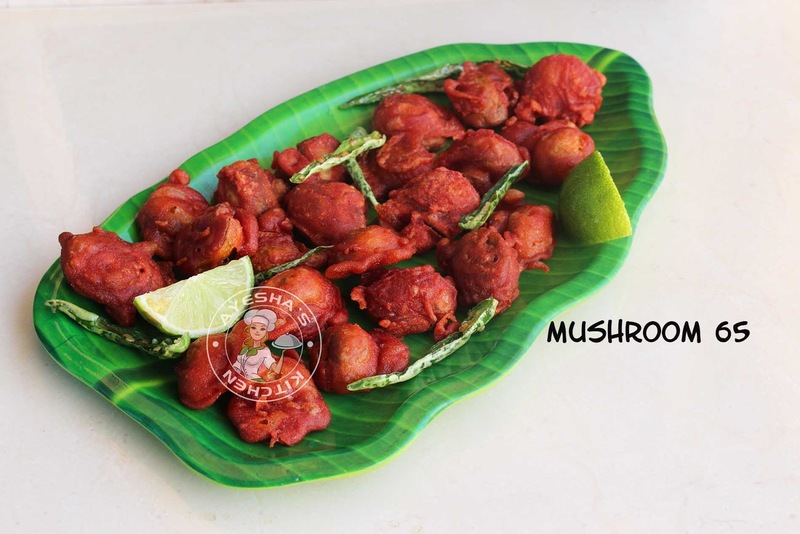 You can make a variety of tasty dishes with mushroom. I have shared many yummy mushroom recipes on my blog. Mushroom pulav, mushroom curry, mushroom chili, mushroom popcorn, mushroom soup like so. Here am going to share yet another veg side dish with mushroom. It is very simple to prepare a side dish with this versatile veggie even if you are in a hurry. Mushroom 65 recipes are very tasty veg side dish which pairs best with fried rice, ghee rice etc. 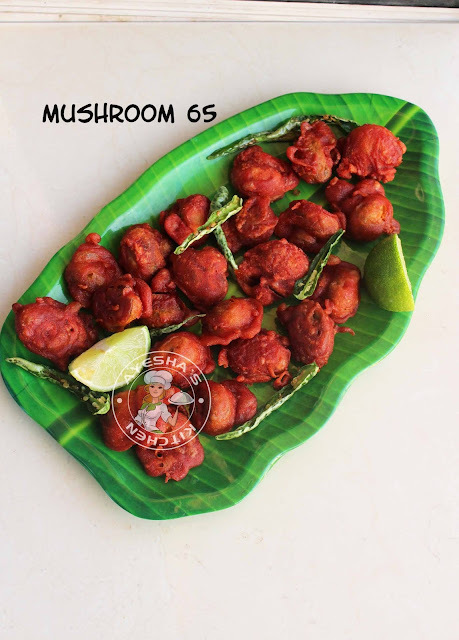 So let us see how to make Mushroom 65 recipe at home. Cut each mushroom into halves and set aside. Now boil a cup of water in a wok. Once it starts to boil, add salt and soy sauce. To this, add the mushroom slices and let it cook for 5 minutes. When done, drain it to a colander and set aside. In a bowl, add All purpose flour, cornflour, garlic powder, garam masala powder, chili powder, vinegar, salt and red food color (optional). Mix very well with little water. The consistency must not be too thick nor too thin. Slide the half done mushroom to this marinade and combine well to coat. Let it set aside in the refrigerator for an hour. Heat a wok or non-stick pan with oil for deep frying. Slide the marinated mushroom one by one to the hot oil with a spoon. (each mushroom pieces must be well coated with the marinade). Frying until golden and done. Transfer it to a plate. Fry the remaining marinated mushroom and set aside. Finally return the fried mushroom again to the hot oil for double frying. This makes the mushroom 65 crispy and tasty. Please click on the link to watch how to make paneer tikka masala at home.